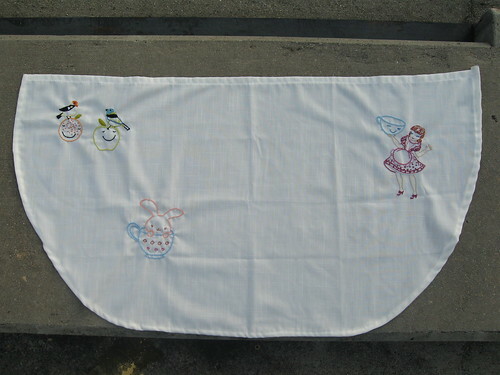 So the Craftster Tea Towel Tour that I mentioned a few posts back is well underway! I've already completed my first two designs for the other swappers and thought it was a good time to share. I was very pleased with how this turned out. My favorite part? The little berries made from french knots of variegated thread. I searched high and low for inspiration and actually had several ideas, but knew that I found the perfect idea when I looked at another of my favorite Etsy shops, beethings. 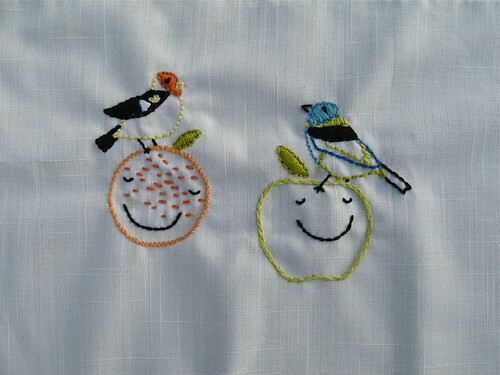 I fell in love with a series of prints featuring tanager birds atop smiling pieces of fruit. 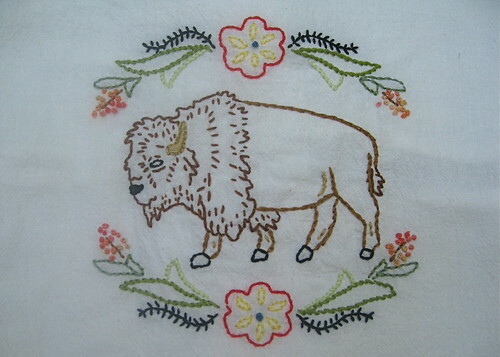 Because I thought it was proper etiquette, I reached out to the artists and shop owners -- Jeff and Shay -- and asked permission to stitch their designs.Fortunately for me , they obliged! In fact, I think they were a bit tickled to see what I would do. I had a bit of a time with this one, mostly because I tried to do some satin stitching and ... well, my satin stitching leaves a lot to be desired. I also had a rough time with their eyes ... I kept making them either too big or too small. Overall, though, I'm happy with the result. This swap's a lot of fun, but the biggest challenge is that it's so fast-paced. You have one week to turn around each item from the time you receive it until you have to send it along. I think I have to learn to keep it simple and not bite off more than I can chew! 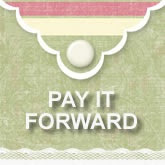 I've been keeping my eyes peeled for a Pay it Forward exchange. I love the idea: you can receive a personal, handmade gift from a talented crafter, and all you have to do is "pay it forward" and agree to do the same for three people. I was lucky enough to come across Hillary's offer to pay it forward and accepted. And now I need to find three people to accept my offer. If you would like to receive a handmade gift from me, and are willing to make and send a handmade gift along to three of your blog readers, please let me know in my comments. Once you accept, you will receive something from me within 365 days. In turn, you will have 365 days to fulfill your end of the bargain. 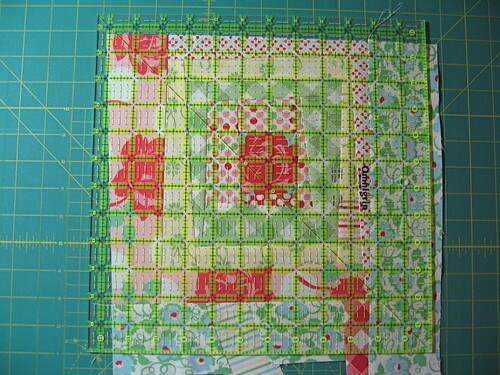 I apologize that it's taken longer than expected to post this fourth and final block for the quilt-along. 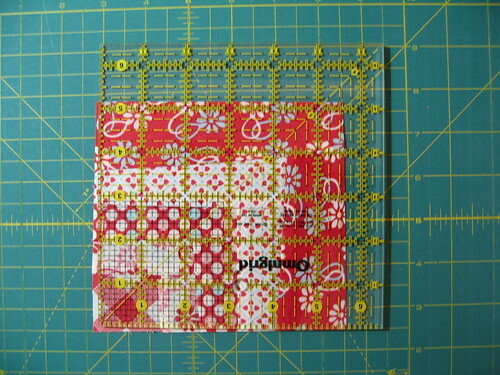 I really didn't know what to call this block, but it seems to me like a wonky version of the popular bento box block. 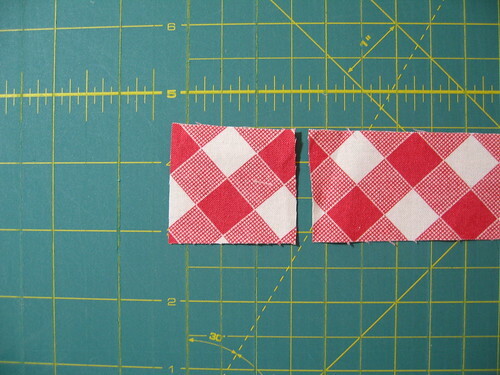 I'm sure that many of you perceptive folks have already figured out that it's just four smaller quarter log cabin squares arranged in a "round-the-block"-type manner. This block takes just a little bit longer to make than the others, but I think that extra work is rewarded by the more complex look that it achieves. 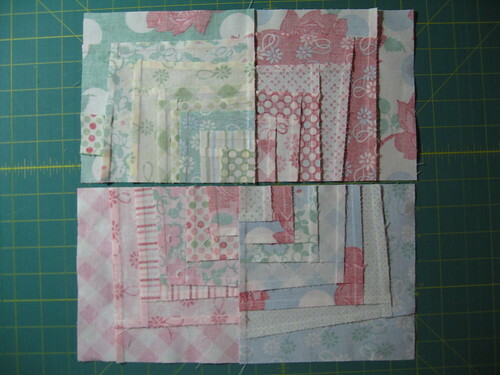 I am in love with its final effect and think that an entire quilt made from these blocks would be stunning. Edited to add: Looking for a shortcut? 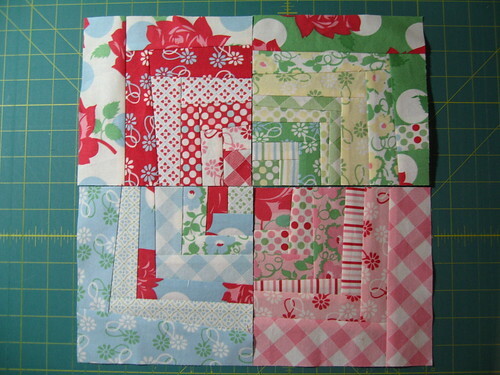 You can always make a couple of larger wonky log cabin blocks, cut them into quarters, and rearrange them to achieve the same effect. 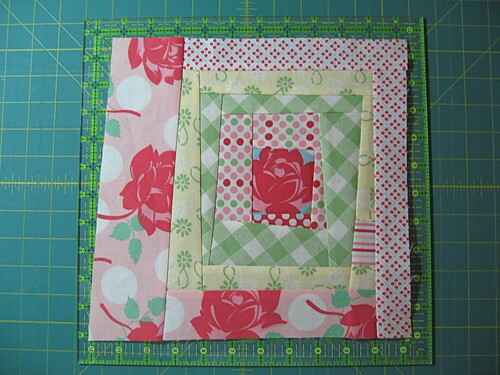 Your block would have to be 13" square to yield four 6.5" quarter blocks. 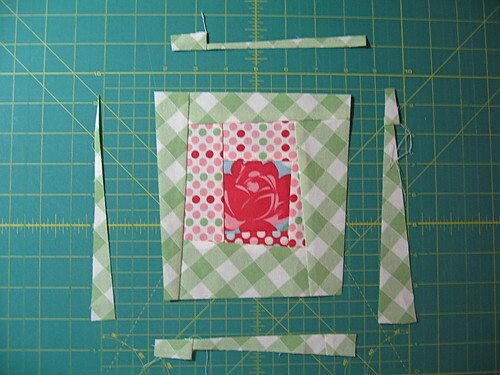 My only advice here is to make sure you start with a pretty large starting (center) square, so that it's not lost when cut up. 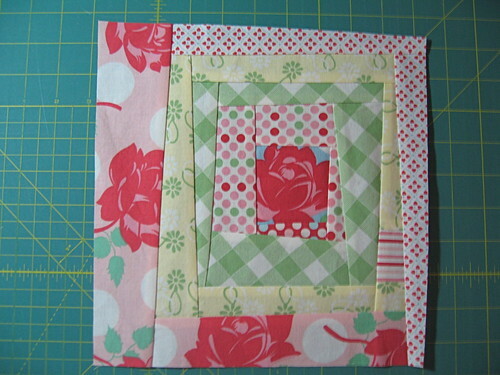 Oh, and you also need to be careful to keep that center square fairly centered in the block. I had intended to include this tip but forgot when writing the post. 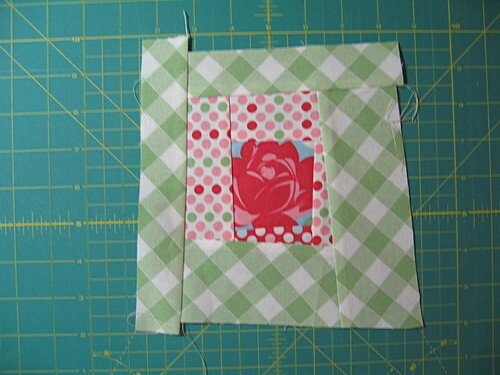 Thanks, Tami, for suggesting the idea in your comment and reminded me to come back and amend the tutorial! So that's it! 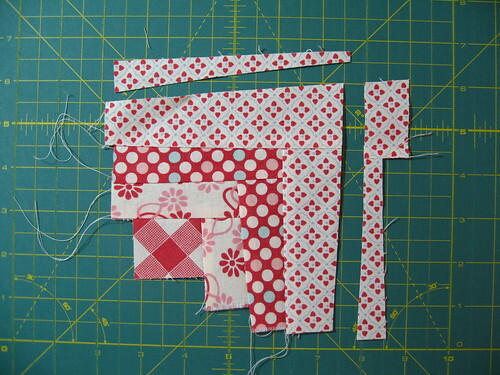 You're now armed with the information you need to make four different variations of the wonky log cabin block. 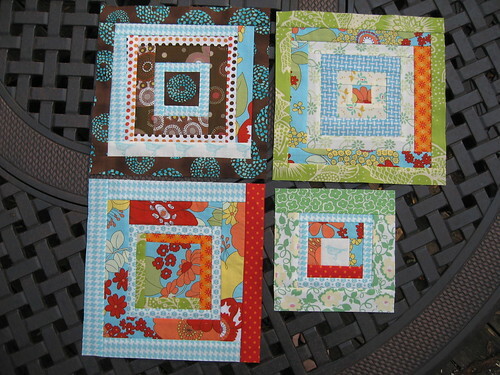 Now the decisions are yours: how many blocks your quilt will be, and which style(s) you'll use. Most importantly, HAVE FUN!! I really can't wait to see what you come up with! Don't forget to post your pictures to the Flickr pool. 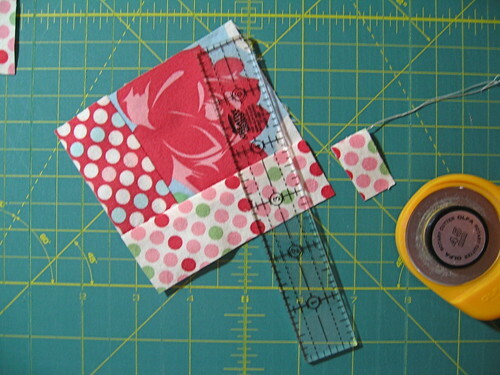 I'll check back in a few days with some reminders of wonderful resources for basting, quilting, and binding your quilt. Things have been crazy busy around here! 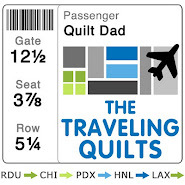 Between the quilt-along, my parenting duties (both of the real and swap varieties ... not sure which is more stressful and time-consuming at the moment! ), birthdays & soccer games (stay tuned for pics!) and ... oh, yeah ... my real job, I've felt really stretched the last few weeks. Despite all of that, I am happy to report that I have basted, quilted, and bound 3 (!) large-sized quilts over the last two weeks!! 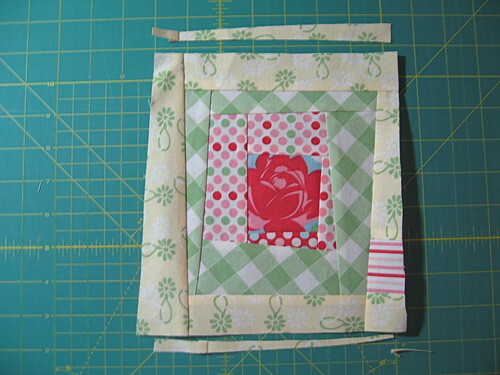 (Technically, I am still binding the third, but the end is in sight!) 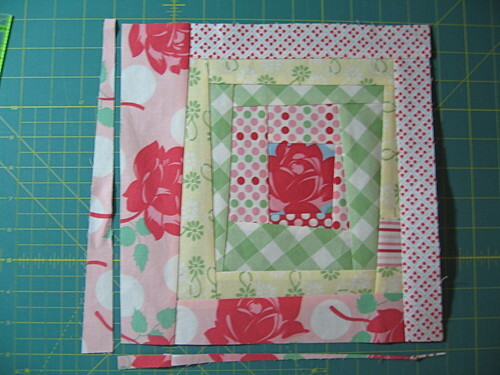 As many of you have astutely noted, I tend to show a lot of blocks and mini quilts on my blog, but tend to avoid tackling the larger projects. Well, no longer. 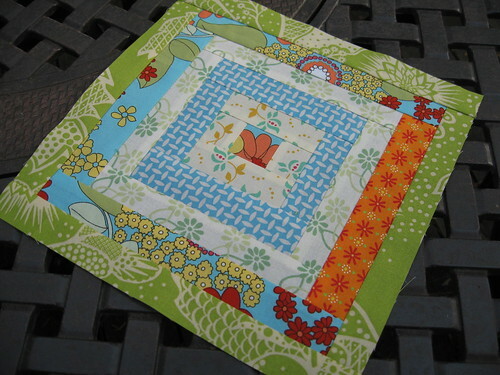 I will have some larger quilts to show in upcoming posts ... two will be featured here, and one will be featured elsewhere ... more on that soon. 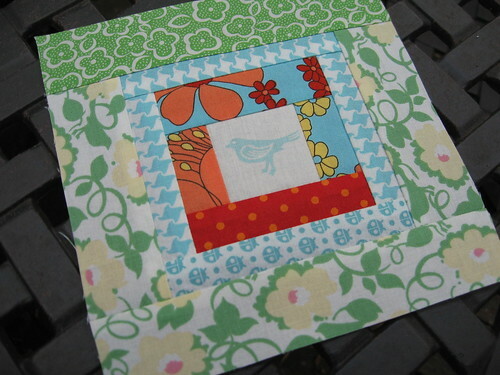 Oh, and if you're here for our final block of the quilt-along, it should be posted mid-week. 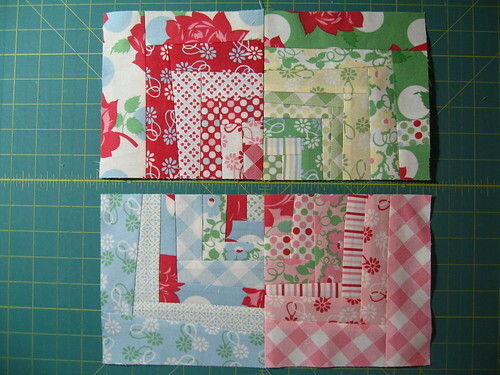 And now for my monthly run-down of the blocks I've created for my quilting bee buddies. 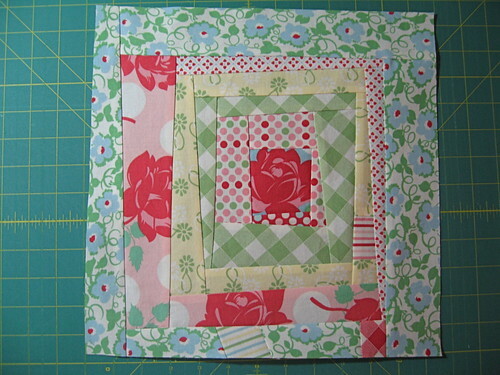 Here are all of my August blocks. With only a little more than a week left in the month, I guess I'd better get started on my September ones ... ! 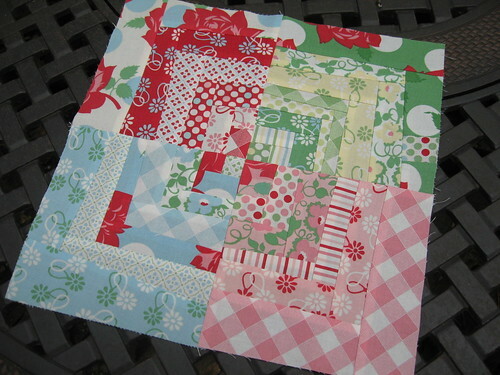 Lucinda, who blogs at Septemberbird, sent some vintage-y greens and creams and asked for a variety of small blocks. 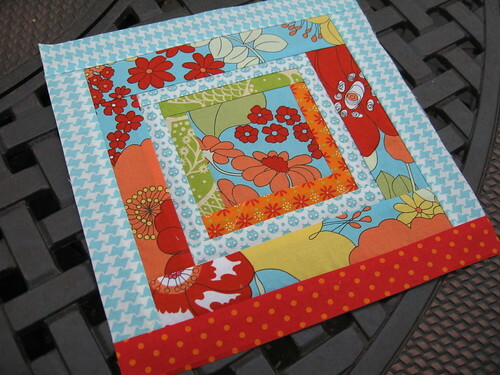 Her fabric evoked traditional styles and the Civil War era, so the other quilters began making some beautiful, beautiful blocks. 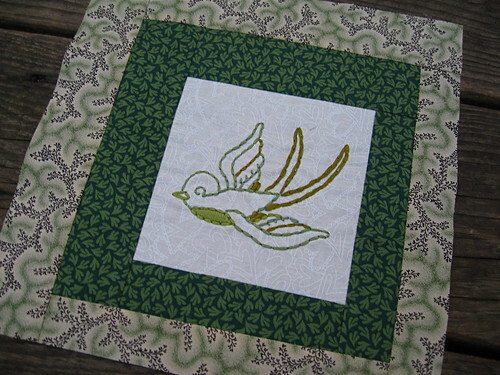 I decided to infuse a little something different by adding an embroidered square, keeping with the green theme and incorporating Lucinda's love for birds. 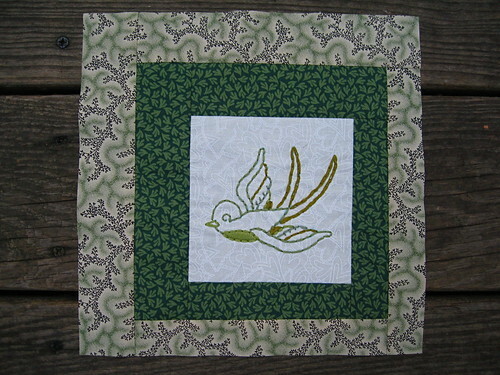 (Pattern is from Jenny Hart's Sublime Stitching book). Several people commented that it reminded them of Charlie Brown! Ha! 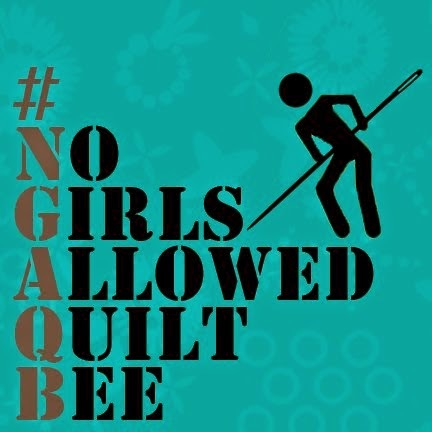 You should check out the bee inspired pool to see Krista's other blocks -- this was a great idea for a quilt, and everyone has made simple yet beautiful and graphic blocks for her. I think it's cute and pretty indicative of my style! 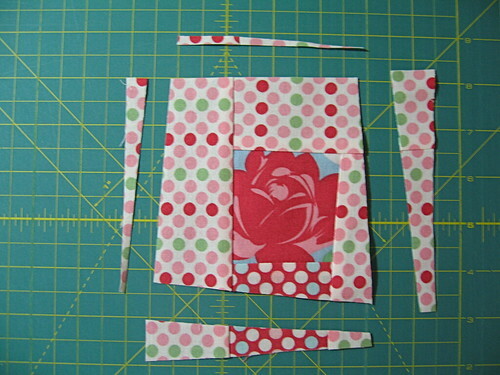 Sudi-Laura blogs at The Adventures of a Fabric Junky. August was Alissa's month in SewConnected 2, and I must admit that I was a bit intimidated by this one. 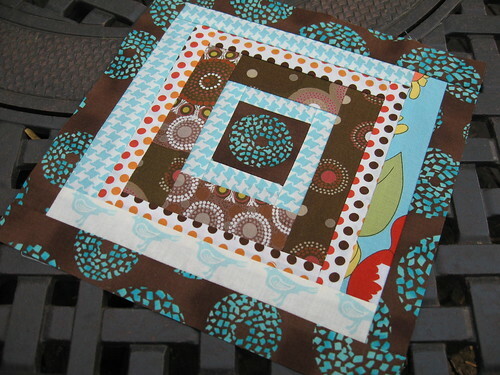 Alissa (who blogs at Handmade by Alissa) is such a talented and prolific quilter and such a master of the modern style that I wanted my block to be "up to snuff". 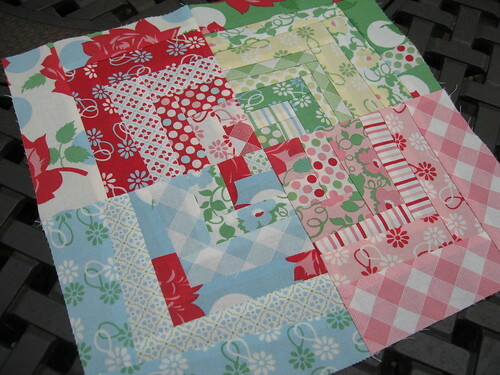 I did a bit of research and found an awesome quilt that is a fave of Alissa's, and took my inspiration from it. Simple yet modern, and my best attempt at making something in Alissa's style. I was on a roll and made a bunch of extra 6.5" blocks. 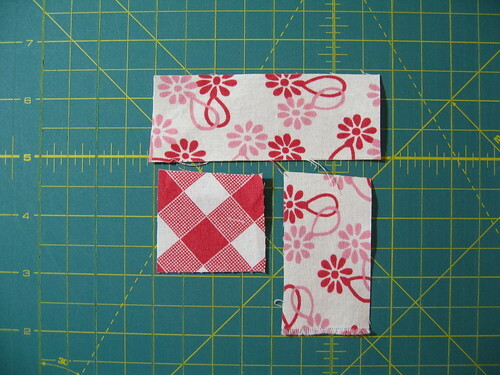 I hope Alissa can use them somewhere in her quilt -- maybe even in the back -- or for another project. Finally, it was Amy's month in the original SewConnected group. Amy blogs at A Commonplace Life. 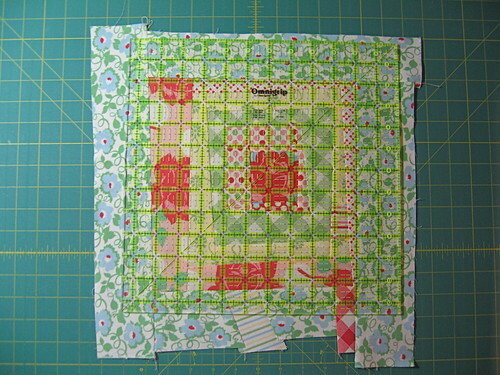 She really wanted her own scrappy version of the popular Kaffe Fassett "Jewel Squares" pattern from his Glorious Patchwork book. 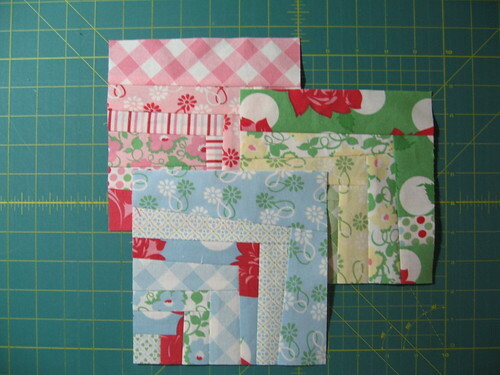 I really loved the (seemingly random but ultimately genius) selection of fabrics that Amy sent for her blocks. I really think this is a case of the old home decorating adage -- just build it from things you love and it will all come together beautifully. 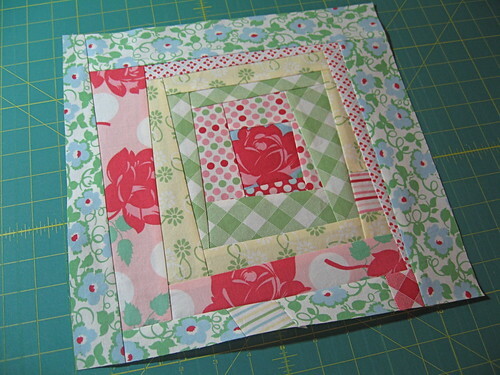 I can only assume that's how Amy's scraps have become such amazing quilt blocks. 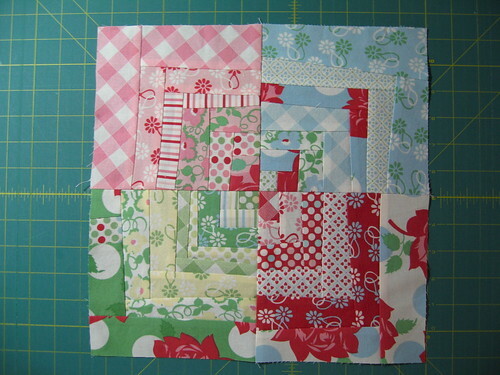 I really love these blocks -- each and every one -- on their own merits. 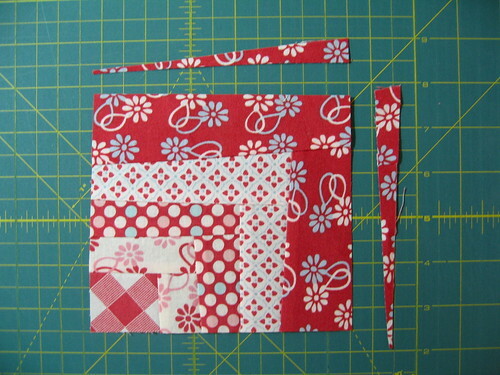 And I'm even more excited to see how they come together with everyone else's in Amy's final quilt. My streak of good luck has continued! I've won two more giveaways. 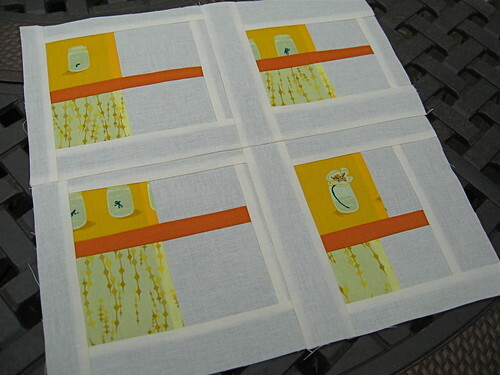 First, I won a set of handmade Amy Butler tags from Kelly at I Have A Notion. 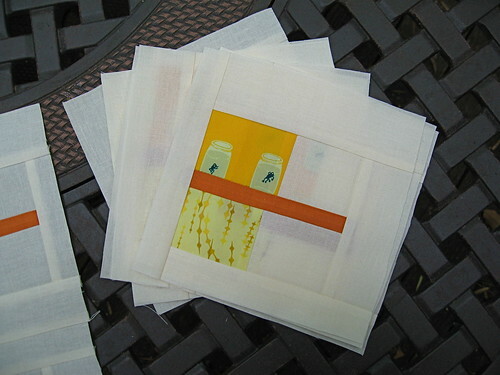 Then, I won some half-yard cuts of my current favorite fabric line, "Good Folks" by Anna Maria Horner, from new quilt-along-er Joan at Wishes, True and Kind. Thanks so much, Kelly & Joan! Wow, at this rate I should really go out and buy a lottery ticket. 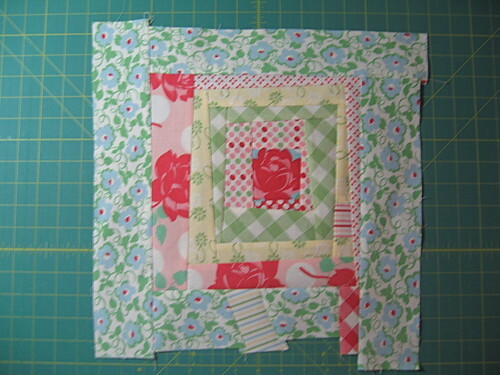 And now, back to business : ) Welcome back for the third block variation in our quilt along. 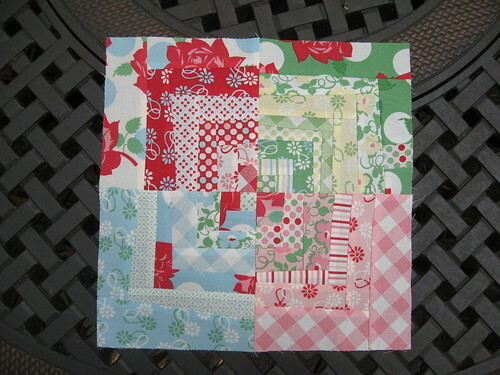 This version is our wonky square-in-square block. We will largely be using the steps from our first block variation, combined with some of the techniques introduced in the second. We will be constructing this block in much the same way that we made our wonky log cabin block, except that we will (mostly!) 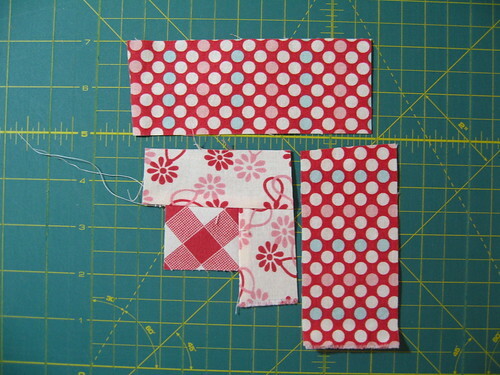 use the same fabric for each round of 4 logs. Make sense? 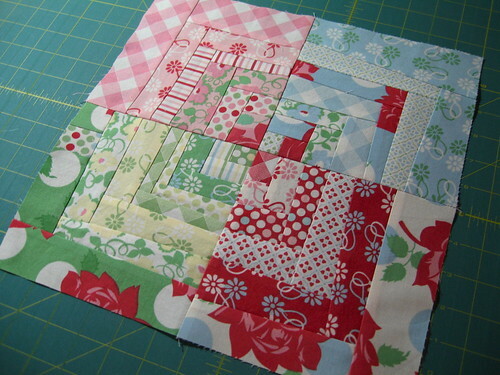 Since you are all now seasoned pros at wonky block making, I'm going to move a bit more quickly. Besides, I can tell by our Flickr pool that many of you have already figured this block out on your own! 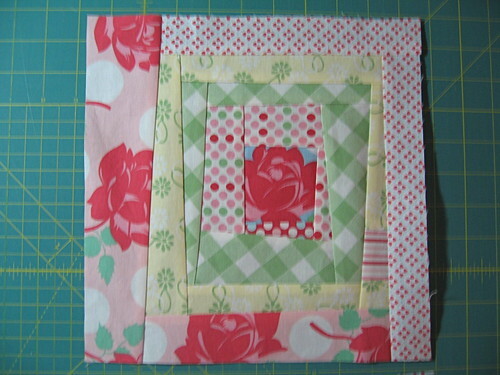 First, as always, begin with a center square for your block. 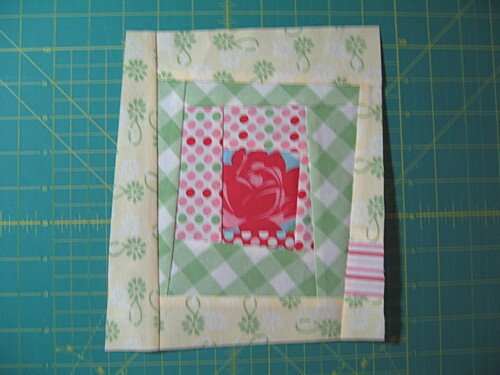 I started with a nice, fat 3" square this time, for no reason other than that I wanted to feature that rose design. As with the other blocks, I shaved a bit off of some of the sides to start giving the block some of its interesting angles. This time, I cut on 3 of the sides. As usual, you can skew anywhere from 0 to 4 of the sides ... and as severely or as subtly as you'd like. Try it out a few different ways and see what feels the best for you. Let me stop for a sec and point out that nifty little ruler that you see in the picture above. 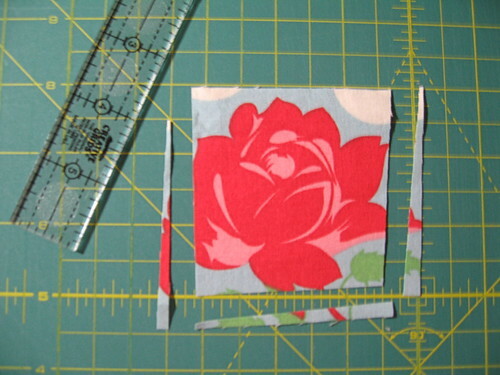 I know I mentioned at the start of this quilt along that the only tool I'd recommend is the 12.5" ruler. Well, a strong second suggestion would be a little ruler like this one. 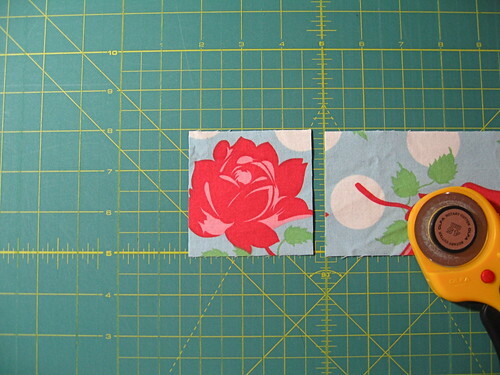 It's much more convenient to make small trims with it than with my larger, bulkier rulers. Next, plan your first round of logs. 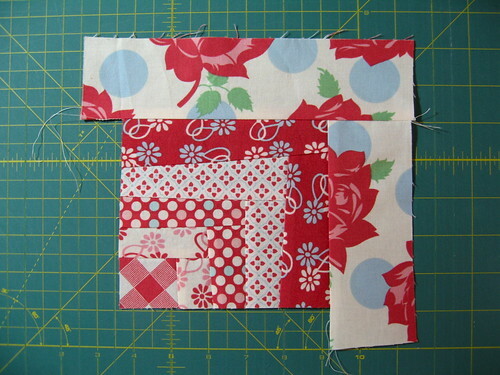 When I make these blocks, I usually like to make my first log from a different fabric than the next three. I don't know why, but I suspect it's because I saw Denyse Schmidt do something like that in her blocks. Of course, this is completely optional ... but consider adding a "random" log somewhere in your block, if not in your first round than maybe in a later round. Try it out in the same pattern as your other logs but in a different color, or from a different pattern in the same color. It'll be cool ... I promise. 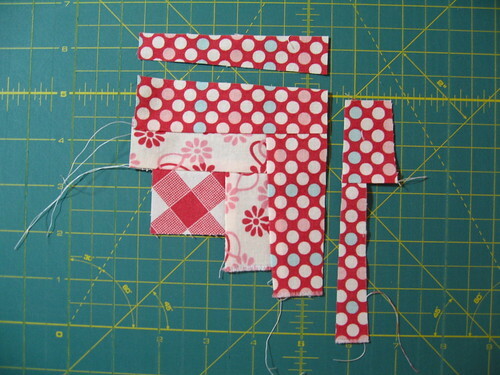 Sew, press, and trim, as you might expect. 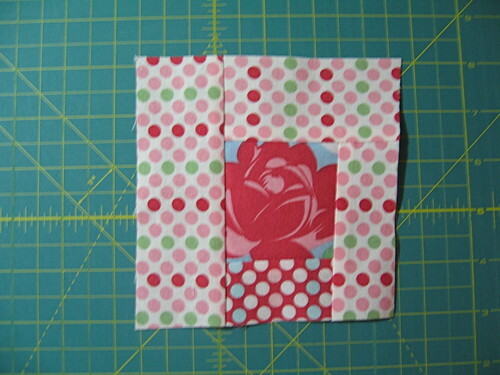 You might notice that I added thinner strips on the bottom and right side, and wider strips on the top and left. 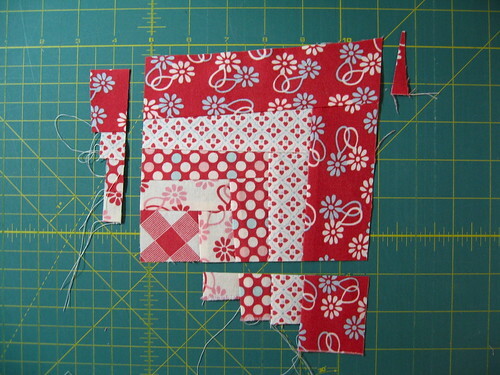 Alternating your strip sizes is a nice way to offset the block's center and keep that middle square moving throughout the block. 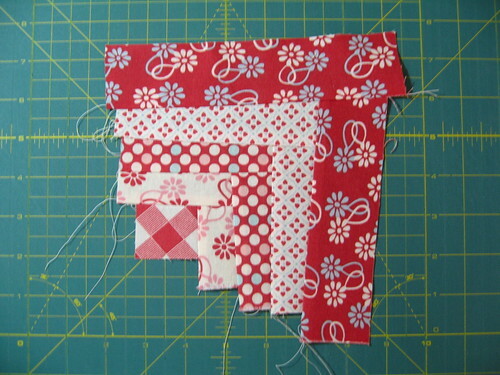 This is a great time to point you to a wonderful post about some tricks to making effective wonky blocks ... check out Jenny's post on her blempgorf blog. I went pretty severe on this one ... by my standards, anyway. On to your third round of logs. So here's what I determined about my block at this point: it's looking far too rectangular, taller than it is wide. Keep an eye out for some common pitfalls, like blocks becoming rectangular, a corner becoming way too pointy, the center sqaure being pushed too far to one side, or the block taking on the shape of a parallelogram. Time for your fourth round of logs. Here's another technique you may (or may not) want to try. 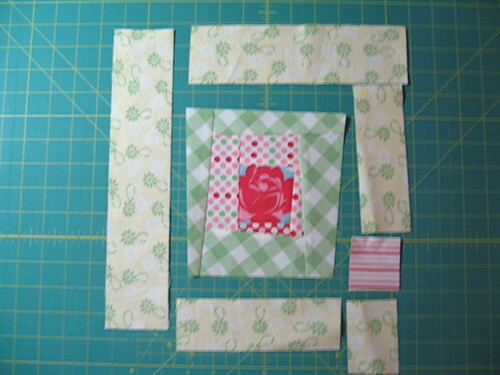 Square-in-square blocks are built off the premise of using the same fabric for each round of logs. But who said you always have to follow that rule? 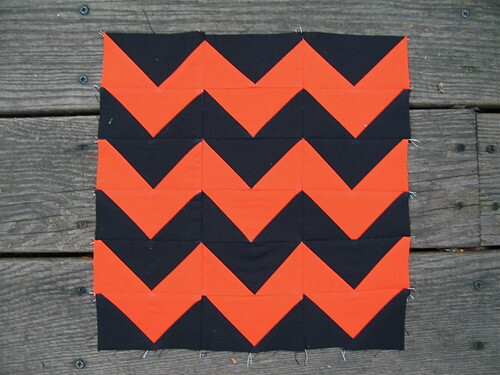 Isn't the first rule of wonky block making that there are no rules? 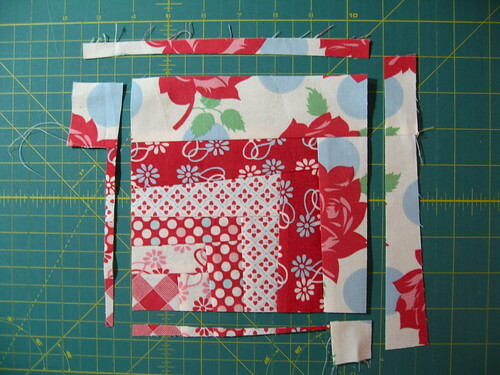 For my block, I decided to use one fabric for the bottom (first) log, switch to a different pattern for the next two logs, and finish out the round with the same fabric as the first. Errrrr ... and now you know why I recommend this step. First, it helped me to see that I should be good to go with just one more round of logs. 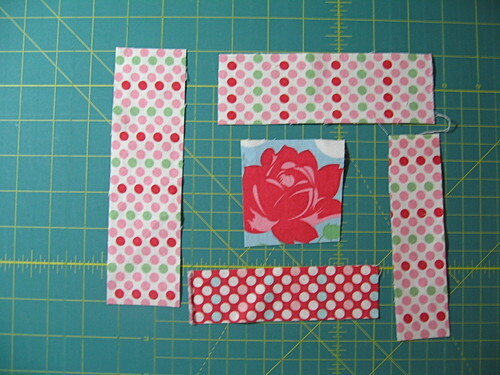 (And, as I mentioned in my last post, you don't always have to use 3" strips for your outer borders. 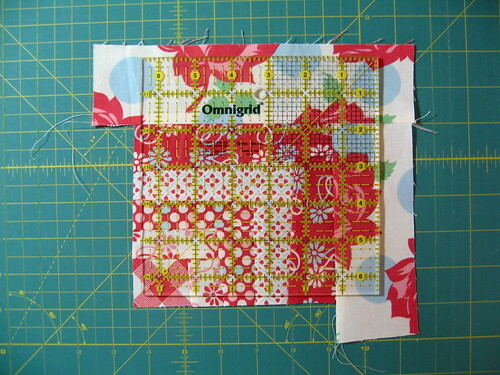 My ruler helped me to see that I can use 2" and 2.5" strips for my outer borders, and still have plenty of room to trim). Also, in this instance, it helped me see that my bottom left corner was sticking way too far out. Did you notice me practicing one of my earlier tips, too? Look at the left side of my block. See how the yellow log went from skinny at the top to wider at the bottom? I wanted my trim of the pink rose log to offset that angle and balance it out a bit, so I cut that strip to be wider at the top and skinny at the bottom. And voila! 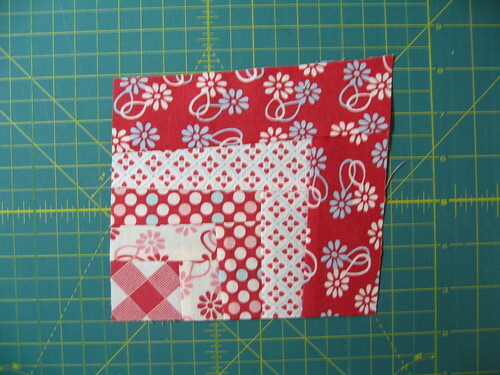 There you have it, the wonky square-in-square block. 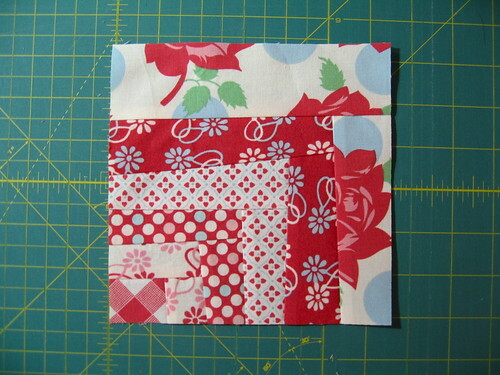 If I could change anything about this block, I think I would have added a solid or two. 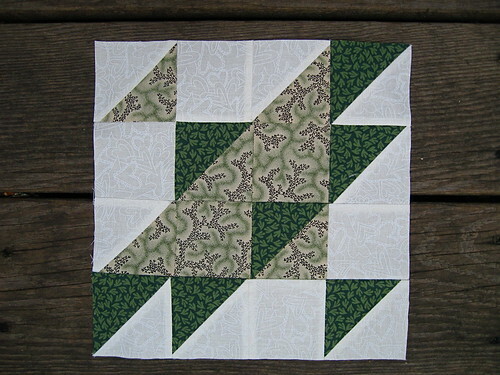 I think, moreso than the other three block variations, this block design really pops with the use of some solids -- I suspect it's because it makes it easier for your eye to discern the square-in-square shape. That seems to get lost a bit when using all prints. 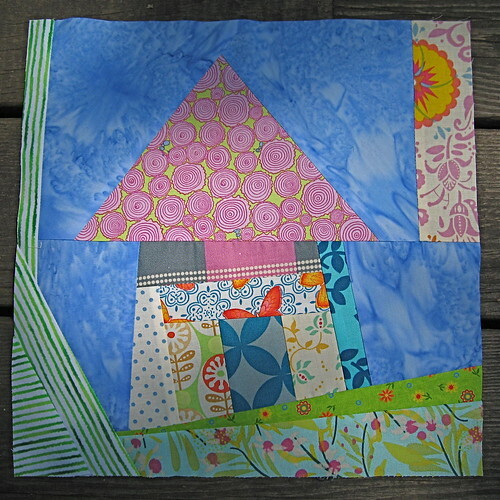 Well, every block can't be a star ... some have to play supporting roles in your quilt, too! As always, I'd love to hear your feedback. I can't wait to see some of your wonky square-in-square blocks pop up in the Flickr pool. 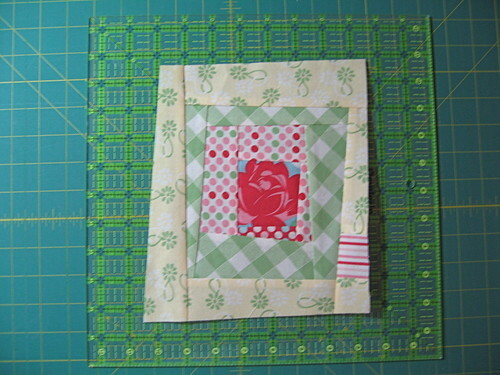 One more block to go, and then it's up to you to figure out how you want to use them in your final quilt design.